How far do you imagine visitors dig once they click into your category archives? If you’re lucky, you’ll get them to the bottom of the first page. And after looking at stats from a number of different websites, I’d say you’re really lucky if you get even 10% moving onto the second page. And so on your site, what would a visitor find on that first page or two? Would they find your absolute best posts in that category? Unless you’ve just happened to write your very best posts, of course the answer is no. But why not offer them just that? Why not move your best posts to the top of the list on your category pages? That’s what we’re going to do below. Do a little of the heavy lifting for your visitors and make your category pages stronger. I found two plugins that are able to do what we want. They both work in a very similar manner, and I didn’t see much of a difference between them. Both were pretty straight-forward, and both did the trick without a problem. This plugin gives you a new section to work with which you can access from your sidebar. 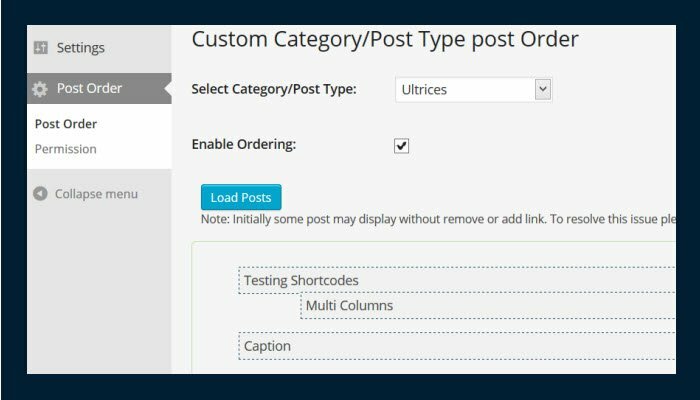 Just choose your category from the pulldown menu, click “Enable Ordering,” load the posts from that category, and then drag and drop them into the order you like. In the screenshot above, you can see me dragging the “Multi Columns” post to the top of the category. And then here it is sitting at the top of my made up “Ultrices” category. One other thing to mention here is that if a post is in two different categories and you move it in one but not the other, it only gets moved in the one you moved it in. This plugin works in a similar manner as the other. Simply drag your posts into position after checking off the few appropriate check boxes. For this plugin, a new menu item is listed under your Posts section. Of course some may say that regular readers don’t want to see the same posts at the top of the category every time they look at it. And that’s true. And so there’s a simple solution to that. With this solution above, you are only changing the top posts. All the others fall into chronological order as usual. And so if you wanted, you could simply explain that the “most popular” posts are first, and the others are in chronological order. You could even link to the page where they start, probably Page 2 or Page 3 of the archive. See how to easily add something like that here. If you didn’t see it before, be sure to check out another relatively recent post about sprucing up your category pages.